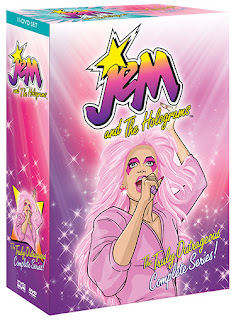 A Borderline Mom: Jem and the Holograms: The Truly Outrageous Complete Series on DVD!!! Jem and the Holograms: The Truly Outrageous Complete Series on DVD!!! Growing up in the 80s introduced me to all kinds of awesomeness! One of those things was Jem and the Holograms. Jem a normal chick as Jerrica, who had normal problems. Each show actually tried to teach morals (you know how they were in the 80s with the whole after school special ideology). Whether it was a friend who felt like an outcast, dealing with difficult choices... Jerrica experienced them all as either herself or as Jem! Interesting tidbit about this... I actually owned a Jem doll! She had pink hair on top that could be tucked into a hat for when she became Jerrica. She also had earrings that flashed when you flipped the switch on her back. I actually just sold it on ebay a couple years back when I was trying to get out of my hoarding ways... interesting side note I'm sure. "The series 'JEM and The Holograms' ran from 1985-’88 in first-run syndication and still boasts a loyal and vocal fan base. It is frequently credited with influencing fashion in the late 1980s and beyond, and launching the careers of female pop-rock stars and music groups. The series follows Jerrica Benton, whose discovery of Synergy, a powerful computer companion, allows her to transform from co-owner of Starlight Music into rock star Jem. Teaming with her sister and best friends who form The Holograms, Jem sets out to make their musical dreams come true, even as she battles against the ruthless Eric Raymond and his musical protegees. 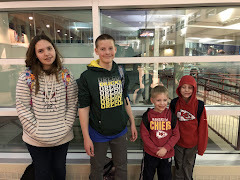 Family Time Factor: I actually think it can be enjoyed by boys and girls, but I think the boys would throw a fit after they got to be 7 or so. And it gets a bit cheesy the older the child gets. I can tolerate it still. 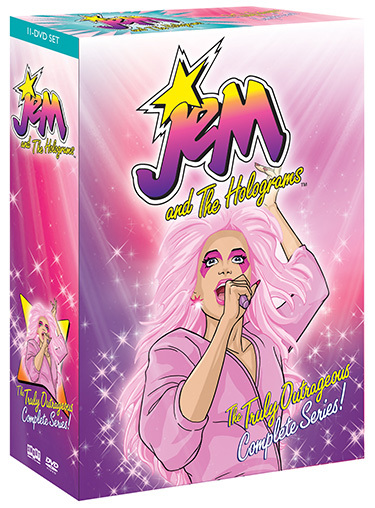 Jem and the Holograms: The Truly Outrageous Complete Series is now available on DVD!! !